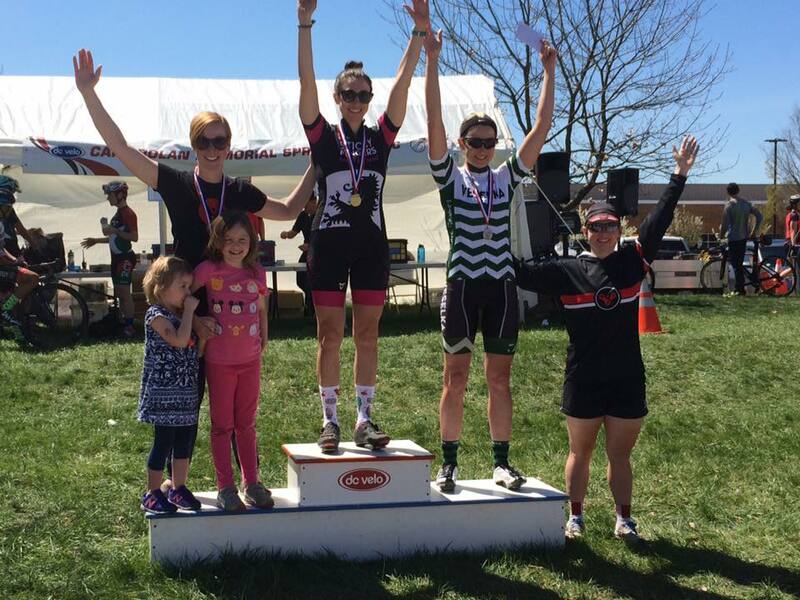 These are the best "podium girls." I got to be on the podium! Whee! Carl Dolan was a nervous race, last year. There had been crashes the year before (lots of them, with many injuries). The women's fields, which started out separated by a minute, ended up coming together into one big pack when the women's 3/4 field caught the 1/2/3 field. Rather than neutralizing the fields to keep us separate ("Sort yourselves out, ladies! "), the officials allowed us to race together. It was messy, and stressful, and didn't end well. I think everyone managed to stay upright, but it wasn't one of my favorite experiences ever. And I was taking things way too seriously, so much so that it wasn't fun for me (or anyone else). As a result, I was nervous about Carl Dolan. But I needn't have been! DC Velo, the club that puts on Carl Dolan, went the extra mile to mark road hazards and fill in pot holes. The officials gave us 90 seconds between fields instead of 60 seconds. And when the 1/2/3 field threatened to lap us, the moto officials stopped us and let them go by, rather than allowing us to all come together. Perhaps more importantly, the positive racing environment that I felt at Jeff Cup continued for this race! Maybe it's because there's a critical mass of us that know each other well this year; maybe we're all more experienced; maybe it's down to smaller field sizes than what we had last year; I'm not sure why it feels so much better, but I think it's bigger than my own attitude and experience. I hope everyone feels as welcomed and supported in our 4/5 races as I feel. VWS had two women in the 4/5 field and two in the 1/2/3 field. The fields were separate, though, so we wouldn't be working together. That left the two of us vs. the peloton. We made a tentative plan as we warmed up, but mostly agreed that our goals were to ride safe, ride smart, and enjoy the racing. Carl Dolan features a two-mile circuit with one big climb going up to the finish line and one fast-ish descent going into a hard right turn. Our VWS plan was to stay near the front and ride heads-up. There were attacks from the beginning of the first lap, which we took turns covering without needing to communicate very much. I looked around periodically to check and make sure my teammate was nearby; I knew if I didn't see her, I might need to cover the next surge. We tried an attack at the bottom of the sharp right-hander, riding off of our awesome cornering skills (I don't think they're that much better than anyone else's, just to be clear). But everyone attacks there, and nothing was going to stay away from that point. There were a few surges up the hill where I had to dig deep to stay in touch with the peloton. I felt myself sliding to the very back of the pack multiple times! I attacked over the crest of the hill at one point, and stayed away for . . . not very far. Maybe the first quarter of the lap? That was the third or fourth or fifth lap; I'm not sure. I have footage from my GoPro, which I will consult (and post!). I don't remember the details of the race very well; it's all foggy in my brain. On our eighth lap of ten, the moto officials warned us that we might be lapped and that he would keep us to the right so the 1/2/3 field could pass us. We waited and waited for them to ride by, but they slowed down just enough that they weren't coming by us. Finally, the moto pulled us over into a driveway to let them pass; his concern was that they would finally come past us right at the finish line, making a huge mess as two fields tried to finish uphill with riders attacking too soon and dying and other riders coming past them . . . It was a good choice, and I'm glad they made it. I know there were people in my field who didn't like the choice, but I was very grateful for it. As a result of the neutralization and because we'd been lapped, the moto told us that we would come around and get the bell. In other words, we would be on our last lap after we crossed the line again. I expected very hard riding as soon as we got going again. And, just to make sure the riding was hard, I put in a hard dig at the sharp right hander (yes, where everyone attacks and no one stays away). I got caught on the climb, and managed to cling on to the pack as they came by. Then I re-positioned towards the front (but not on the front) of the pack and determined to sit in until the last possible moment. On the back stretch of the final lap, an NCVC rider attacked. It was a good place to attack, too! 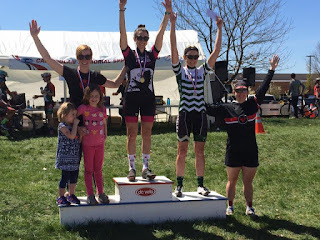 She got a sizable gap on everyone, and no one seemed very motivated to chase; NCVC certainly wasn't going to chase down their own rider, and my teammate and I were both content to let the other, larger teams do most of the work to bring it back. I sort of expected her to blow up on the final climb, anyway. A Sticky Fingers rider and a Bike Lane rider did most of the work to keep her within reach. Then we came around the last corner, and I can't remember much. I think I tried to stay out of the wind. A Phase Cycling rider attacked way too early, but I think that was part of their team plan. I remember coming around her as she faded. The pace was hard up the hill. I was barely hanging on, but I knew the pain would be over soon. I found my teammate's wheel and thought, "Oh! This is perfect! This is what we're supposed to do at the end of races!" I was hoping I could find an extra gear at the top of the hill and pick up places, but it was clear by the time we came in sight of the finish line that the only person I would be able to pass with my deteriorating legs was my own teammate. I counted the people in front of me, and estimated that we'd finished fourth and fifth. And that was a good result. Turns out that one of the riders I counted was a leftover from the 1/2/3 field, though, and the two of us got third and fourth! We both got to stand on the podium together and represent our team. That was a really great, exciting result. We rode smart, we made good choices, we worked together without even having to talk to each other, and we both ended up on the podium. And we had fun! I wish I could have had more left after that final climb, but I considered it a victory to make it up the hill in touch with the group I was in. Even without a final kick to the finish, I felt like I gave 100% in the finale. I'm very happy with my personal results and our team results on the day. We also had a fourth place in the men's masters 35+ and a fifth place in the women's 1/2/3!